If you’re like me, you use your trading computer for hours every day. Maybe you even leave it on constantly. So the efficiency of your computer can have a big effect on your wallet. It’s good practice to periodically check the power consumption of your older trading computer against that of newer models. Make sure you aren’t wasting energy and generating higher power bills because of outdated and energy-inefficient technology. Computers contain parts made of metals and plastics. Like anything in nature, the materials deteriorate with time. And the materials’ ability to do their jobs deteriorates as well. Over time, materials can no longer operate according to their original manufacturer’s specifications. As parts begin to go ‘out of spec,’ your trading computer becomes less and less efficient, draining more and more power to perform the same tasks. Another part of the power equation is the software you’re running. Software is designed to perform best with hardware typically available when the software is designed. Newer software often doesn’t work as well on older hardware. Upgrading to the latest software could result in a hardware-software mis-match which could cause your trading computer to become less efficient. Outdated Technology – As technology has improved, it has generally become more efficient. Your older CPU may consume more energy to boot up than a newer version. Older hard disks dissipate more energy in heat than newer models. More Complex Software – Software algorithms have a direct effect on power use. Newer software generally incorporates more complicated algorithms optimized for newer hardware. So older hardware will have to work harder to perform the same tasks. More work means more energy use. Not Enough Memory – A hard disk requires more energy to access and store information than Random Access Memory (RAM). So if you don’t have enough RAM, your trading computer will access the hard disk more often, thus requiring more energy. Dust Build-up – Dust acts as an insulator on computer components. Your CPU, graphics processors, memory chips, and hard disk will heat up faster with a nice dust blanket in place. If your trading computer’s fan is running continuously, that’s a sign your machine is wasting energy because of too much dust. Your first line of defense against that dust blanket is to keep your computer’s air intake screens as dust-free as possible. See my earlier blog post for ways to keep things clean without risking harm to sensitive components. Depending on the specific model, buying a new trading computer can take care of all of the above issues, making your trading system a whole lot more energy efficient. But you might not be ready to replace your computer. It’s natural for go for the highest performing components. But higher performing specs also mean higher power requirements. Check the software you are planning to use. Match your software and hardware specs to get the best value. The 10X faster CPU will not run your existing software 10X faster, but can end up costing 2X in energy. Manufacturers often make alternative versions of their components, with varying power requirements. Look for “low-power” components when you are purchasing your replacement parts. If you want to buy a new computer, use the same principles as above to check the computer components in models you are considering. Remember that just because a computer is new, it won’t necessarily be more energy efficient than what you currently have. Due to more complex hardware and software, it might even use more power. If you’re shopping for a new computer, be careful not to overbuy. 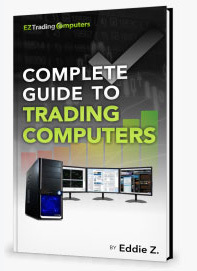 Our buyer’s guide (link below) can help you figure out what’s right for your needs as a trader. Photo by INESby on pixabay.